Radisson Hotel: Madison, WI | Cornerstone Hotel Management, Inc. 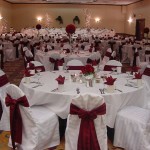 The Radisson Hotel is conveniently located on Madison’s West Side off of Odana Road, 2 blocks from West Towne Mall. 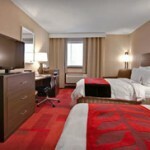 This 153 room-hotel has easy access to all Madison has to offer. The Radisson Hotel is minutes from downtown and is perfect for business and leisure guests seeking an inviting atmosphere and Madison attractions. Featuring a complimentary hot breakfast buffet, indoor pool and whirlpool and executive and whirlpool suites, the Radisson Hotel is sure to please the vacationing family as well as the traveling business person. Make the Radisson Hotel your second home for all WIAA Tournaments and Badger home sporting events! 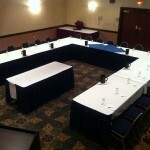 Large Conference facilities and small meeting rooms. Asira Bathroom products exclusively developed for Radisson. 37″ Flat Panel color TVs with cable featuring HBO. Basie’s Restaurant and Lounge serving breakfast, lunch and dinner. Six Suites including two Jacuzzi Suites.